Zone9, an informal group of young Ethiopian bloggers and activists working together to create an alternative independent narration of the socio-political issues in Ethiopia, all members based in Ethiopia, has just released its second Online Campaign titled “Freedom of Expression to All, Now!” today (20 Feb 2013). The general aim of this campaign, says the Presser, is “to express concern on the danger paused by the ever growing media censorship in Ethiopia.” The Group previously campaigned for one week calling the “Constitution to be respected”. Zone9 is an informal group of young Ethiopian bloggers and activists working together to create an alternative independent narration of the socio-political issues in Ethiopia and thereby foster public discourse that will result in emergence of vibrant, well informed and proactive community of readers for the betterment of the Nation. 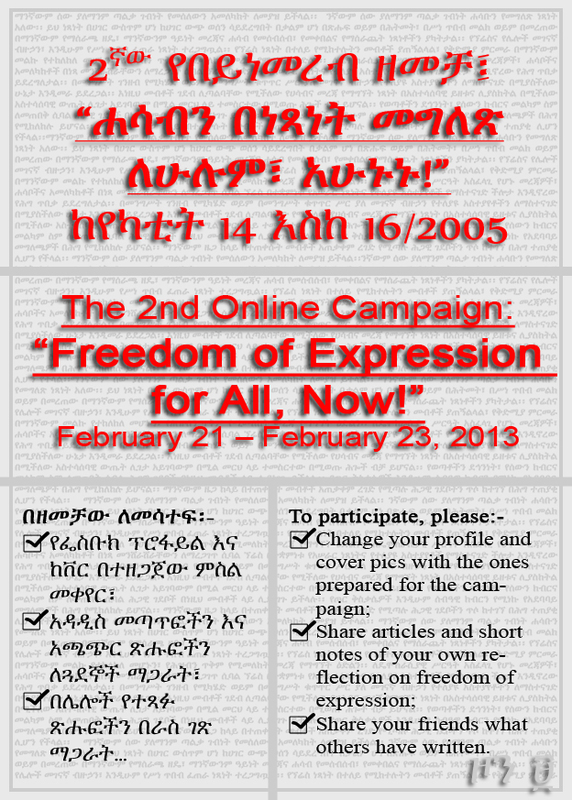 Here we come again with the second online campaign, this time under the motto “Freedom of Expression to All, Now!”. This campaign coincides with the blocking of our blog and, recently, our Blog’s Facebook page for Facebook users without Secured Socket Layer (https://) connection. The main Blog, like several other Blogs, has been blocked from being accessed in Ethiopia for more than eight months now. 1. Everyone has the right to hold opinions without interference. 2. Everyone has the right to freedom of expression without any interference. This right shall include freedom to seek, receive and impart information and ideas, regardless of frontiers, either orally, in writing or in print, in the form of art, or through any media of his or her choice. (a) Prohibition of any form of censorship. (b) Access to information of public interest. 4. In the interest of the free flow of information, ideas and opinions which are essential to the functioning of a democratic order, the press shall, as an institution, enjoy legal protection to ensure its autonomy and diversity. 5. All media financed by, or under the control of the State, shall be regulated in order to ensure diversity in the expression of opinion. 6. These rights can be limited only through laws which are guided by the principle that freedom of expression and information cannot be limited on account of the content or effect of the point of view expressed. Legal limitations can be laid down in order to protect youth, and the honor and reputation of individuals. War propaganda as well as the public expression of opinion intended to injure human dignity shall be forbidden by law. 7. Any person in violation of legal limitations on the exercise of these rights is accountable under the law. From Feb. 21 through 23, 2013, during the campaigning term, articles that show the hardship being experienced by Ethiopians who want to exercise their constitutional right of self-expression and the danger censorship pauses on the country’s effort to alleviate itself from poverty, its number one enemy, will be published on Zone9’s Blog and Facebook Page including the page created for this specific purpose. As usual, we call up on the online community to actively take part in this campaign and show the concern is shared among all Ethiopians. We blog because we care!! !